Care Packages for Soldiers: Support the Troops When You Shop AmazonSmile! Support the Troops When You Shop AmazonSmile! The Christmas care packages are on their way to the American Soldiers, Sailors, Airmen and Marines serving overseas. As you start thinking about and shopping for your gifts, don't forget to use AmazonSmile and help us support the troops. Black Friday and Cyber Monday are two of the busiest shopping days of the year. This is a great opportunity to support the Airborne Angel Cadets of Texas while you shop. Click on this link: smile.amazon.com and Amazon will donate to Airborne Angel Cadets of Texas. 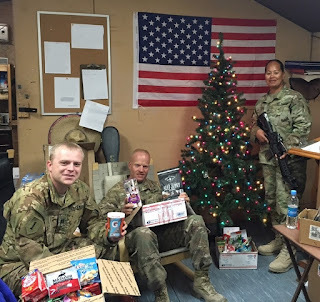 Soldiers celebrating Christmas with care packages! The Airborne Angel Cadets of Texas are proud to support our troops overseas.